What did you think of DAREDEVIL #603? DAREDEVIL #603 by Soule, Henderson and Milla, cover by Sprouse, ships May 30th and here's a preview! I was vaguely aware of the preview, but I was surprised Elektra would show up this quickly. Mike Henderson draws her with Jojn Romita Jr hair, which is fun. I like the way the narration works - it almost seems like his senses were capable of figuring out who she was, but the distance made it tricky. There's a bit of a tease as she removes her helmet, but we have to get to a page turn for the reveal. Matt's promise to Elektra makes me feel very icky. It feels like he's manipulating her again by the promise just like he manipulated her by erasing her memory. Honestly, though, I'm surprised this didn't really lead to a team up adventure. Instead, the story took an interestingly different direction. The decision to release the crime bosses is a fascinating one. On a continuity note, the only way to reconcile this with the Defenders is for Defenders #10 to not have happened yet. It's definitley a little frustrating the lack of coordination. I was going to complain about it not quite feeling epic, but I do think the ending added to the intensity. I'll give it Four and a Half Stars. That first scene with Elektra seemed like a long way to go just to get her to promise to help defend New York against the Hand. I also liked how much Henderson drew her like Romita Jr.'s interpretation, but she didn't sound like Elektra to me. She wasn't mysterious at all. I think Elektra is at her best when she's a woman of very few words. Here she's a chatterbox. Matt calling in the crime bosses to defend their turf against the Hand: I can see his rationale, but he's asking for trouble. Perhaps Matt has a strategy for getting those guys back in jail the second the Hand are defeated. If not, it's just irresponsible. I loved Foggy's jab at Matt about "election" as opposed to "re-election." Perhaps I enjoyed it so much because I don't feel Matt is showing him any respect or appreciation. Or, at the very least, Matt is not listening to anything Foggy is saying. His treatment of Foggy is continuing to bother me. I ended up giving this book a two, which is a failing grade, and it's mostly because of the green fog. The Beast emits it, and it engulfs New York. Soule and Henderson have Matt, Foggy and Blindspot meeting on a rooftop for no other reason than to have Matt be vulnerable to this fog. Matt doesn't smell the fog until it's too late. Let me put that another way. Daredevil -- DAREDEVIL -- doesn't smell the fog until it's too late. Henderson is drawing this fog like it's green detergent bubbles rising out of a berzerk washing machine. We don't know what their effect is. The fog has been around for several panels and Matt has taken no notice? I don't buy it. 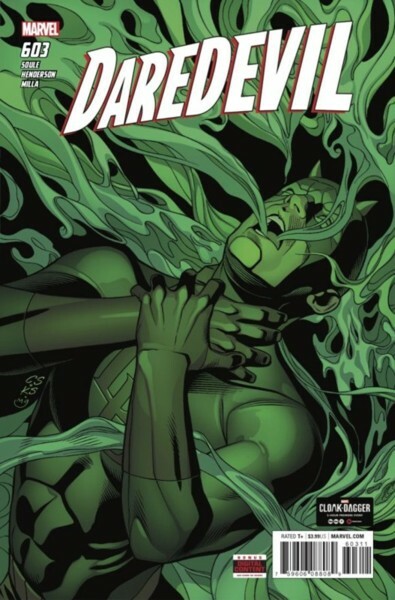 Charles Soule has been writing Daredevil long enough by now that he should know better, and if not him, editor Devin Lewis should have had something to say. How did they let Father Jordan into the building without letting the fog in? I guess that's not important. But what it all boils down to is that this is a massive attack on New York by the Hand. Nothing more than that. How scared of the Hand should I be when they scamper collectively away at the sight of Daredevil? And why did they do that? No explanation. This was a sloppy issue. Henderson's art continues to improve every issue, but this issue isn't worthwhile. I really want to be excited for Matt whenever he runs into Elektra or Echo but their tampered memories just makes it so underwhelming. Agreed with my friend above, I prefer a less talkative Elektra but with how Netflix and Waid wrote her it doesn't suprise me to see her this way. I enjoyed this issue, so four stars from me. I’m very happy that Elektra is back! I liked her interaction with Matt too. Although I would have liked more immediate follow up on the giant hole, I’m wondering how Matt will recover, and while I’m not surprised Father Jordan showed up again, I am surprised it was now in this story in some retrofuturistic battlepriest armor. Matt's promise to Elektra makes me feel very icky. It feels like he's manipulating her again by the promise just like he manipulated her by erasing her memory. Matt didn’t erase anything. That was the purple children. I don’t have a problem with Matt’s promise because he knows that telling Elektra about what Purple Man did to her is just going to lead her back to him anyway. He’s going to be next on that revenge list after Killgrave for not telling her what happened. Might as well get something out of it. On a continuity note, the only way to reconcile this with the Defenders is for Defenders #10 to not have happened yet. It's definitley a little frustrating the lack of coordination. Continuity problems between Bendis and other writers? You don’t say, LOL. But yes, I wish there was stronger continuity control at Marvel. It makes the reading experience unnecessarily trying. I also liked how much Henderson drew her like Romita Jr.'s interpretation, but she didn't sound like Elektra to me. She wasn't mysterious at all. I think Elektra is at her best when she's a woman of very few words. Here she's a chatterbox. Agreed with my friend above, I prefer a less talkative Elektra but with how Netflix and Waid wrote her it doesn't suprise me to see her this way. Well, it’s not just them, it’s everyone lately. She was chatty in her solo mini by Owens, when she joined Agents of S.H.I.E.L.D., her Uncanny Avengers appearance...I think it has to be editorial direction at this point. Matt calling in the crime bosses to defend their turf against the Hand: I can see his rationale, but he's asking for trouble. When Daredevil wishes The Punisher was around so he could ask him for help, you know he’s desperate. It’s a matter of priorities. The crime bosses are the lesser of two evils here. Matt doesn't smell the fog until it's too late. Let me put that another way. Daredevil -- DAREDEVIL -- doesn't smell the fog until it's too late. My interpretation of what happened was that due to his repeated exposure to it in China, Matt was more susceptible to the fog, which is why he was incapacitated so quickly. If that isn’t the case, then I agree with you, it’s stupid. What’s the point of having supersenses then? I’d like to know too. Hopefully next issue we get into more of what’s going on here. What is the Hand planning to do when they have New York? I continue to roll my eyes whenever I see Blindspot. Why is he there? Foggy has a role and it makes sense. Blindspot seems to just be there to once again to steal the glory. Blindspot exists to show another side of Matt as a mentor and father figure and to push a new superhero. It can be argued that we’re getting too much of the latter rather than the former, but I admit some of my patience with Sam is because I don’t feel Matt’s agency, autonomy, or panel time has been compromised. IMHO it’s still very clearly Matt’s book. Plus, Sam isn’t in every issue, which makes me like Sam more than I would if he was always present. In 600 he had the epic fight with Muse while Fisk beat the crap out of Daredevil. Both were supposed to be epic fights. I’m sorry you didn’t enjoy the castle confrontation between Matt and Fisk; I really did. I really don’t think that’s going to be the case, but it is, I will join you in not enjoying it. Matt better not be out all next issue. Well, he hasn't told her, which is making her pretty complicit. On a continuity note, the only way to reconcile this with the Defenders is for Defenders #10 to not have happened yet. It's definitely a little frustrating the lack of coordination. Honestly, Soule isn't blameless in this. It's probably because he is so busy, but he doesn't seem to keep up with the work of others. I believe there are at least two separate "Black Cat turning good stories" (which is problematic in itself, but I haven't read both so I can't say if they can be reconciled). Either way, it appears he missed them both and so did his editor. Exactly. Matt should have told Elektra about all of this back in Daredevil #7. Since he failed to do so, he’s already messed up, and when he does finally tell her, she’s going to be even angrier with him. Matt’s just delaying the inevitable here to temporarily gain her help, and I don’t have a problem with that because he’s in trouble with Elektra either way, and he knows it. I don’t think he does either, which is a problem when he’s using characters that don’t call Daredevil’s book home and are regularly used elsewhere. But it’s not just him; from my understanding, the Venom Inc. "Black Cat turning good” issue can’t be reconciled with the Defenders one, so between those two stories and this one, that’s three writers (Slott, Bendis, and Soule) and three editors that missed this. Marvel really needs a continuity person for each of the lines (street level, cosmic, etc.) There should have been someone reading all three books who could have pointed this problem out to everyone back when there was still time to fix it before print. I honestly didn't even know which story was the other one. Good to at least know it's Venom Inc. The big question I would have is whether the story shows her doing bad things or if it just shows her reforming. If she reforms, does it show it publicly giving up her role as "Queenpin" or whatever. My working theory right now is Defenders occurs over a wide period of time or, if it doesn't, it occurs after this arc (Matt's costume being the biggest roadblock, but he at least has shown a willingness to use both costumes). Felicia Hardy, throughout the story, shows a great ambivalence about being "bad" and could already be considering reforming based on the events of Venom Inc. Anyway, that's my half-hearted attempt at reconciling everything without having read one of the stories at all. Solid 4 stars for me, I quite enjoyed the issue. - I am really glad to see Elektra back and this looks like it is defintely setting up for her and Matt to interact in the near future which is great! Also, I too am a fan of the John Romita Jr/90's look with the curly hair so glad to see that here as well. - One of the other things I enjoyed about this issue was the humor, for example the panel where Matt shows up to fight the Hand with the Elektra and she just causally stabs one of the Hand ninjas or Foggy's comment around Matt suggesting finding Castle. - The art has probably been my favorite of Soule's entire run since Henderson has come on board so that has been another plus. - I think either Matt has a plan with the crime bosses or he will figure one out after the Hand situation is dealt with, I think it is a fun twist on things. - Excited to see what role Father Jordan is going to play in all of this. Loved the armor he was sporting too, almost looked like the power armor from the Fallout games (of which I am quite a fan). - No real negatives for me, maybe there could have been a bit more action; however, my biggest complaint (Blindspot) had a minimal role so all in all not much to complain about here. I don't have an issue with Matt's promise at all and don't really see it as being manipulative. Matt has information and he is going to offer it to Elektra in exchange for help in fighting the hand. I would perhaps feel a little different if he was lying or something; however, he knows that Elektra lives for revenge and she could have refused the offer if she wanted to. Part of me even wonders if she was looking for a reason to stay. While Elektra may have been a bit chatty, I thought she was perfectly in character. I get what they are trying to do with the Matt/Sam relationship; however, I'm just not invested in Sam as a character to care. And while you are correct that Matt's panel time hasn't been affected I feel that Sam's constant presence has influenced the lack of other supporting characters in the book. Hopefully Foggy will be around more now and there will be more with Elektra.